I don’t know what it is about pirates, but they are just fun (. . . in books. I assume they are substantially less fun in real life). Pirate Nap: A Book of Colors by Danna Smith and Valeria Petrone. This was one of Ella’s favorite books for many many months, and the cute illustrations delighted me every time. Pirate Girl by Cornelia Funke and Kerstin Meyer. When Molly is kidnapped by pirates, they have no idea what’s coming when she summons her parents. Shiver Me Letters: A Pirate ABC by June Sobel and Henry Cole. My mom bought this book for us a while back, and Ella was instantly in love. How I Became a Pirate by Melinda Long and David Shannon. Pirates AND David Shannon? This is a match made in heaven. Tough Boris by Mem Fox and Kathryn Brown. Even tough old pirates can get a little sad when their parrots die. The True Confessions of Charlotte Doyle by Avi. This book’s original cover made it a hard sell to boys since it looks like a romance novel, but it’s actually one of my all-time favorites about a girl sailing back to America that turns out to be mutinous. She’s quickly caught in the middle and finds herself standing trial for murder. Peter and the Starcatchers by Dave Barry, Ridley Pearson and Greg Call. I love this story based on Peter Pan, much of which takes place on a pirate ship in the first book. I whole-heartedly second The True Confessions of Charlotte Doyle! It is one of my favorites! Best pirate books ever: Into the Wind by Jean Ferris. Parts 1-3. 'Tween-hood fave that I love just as much as an adult. 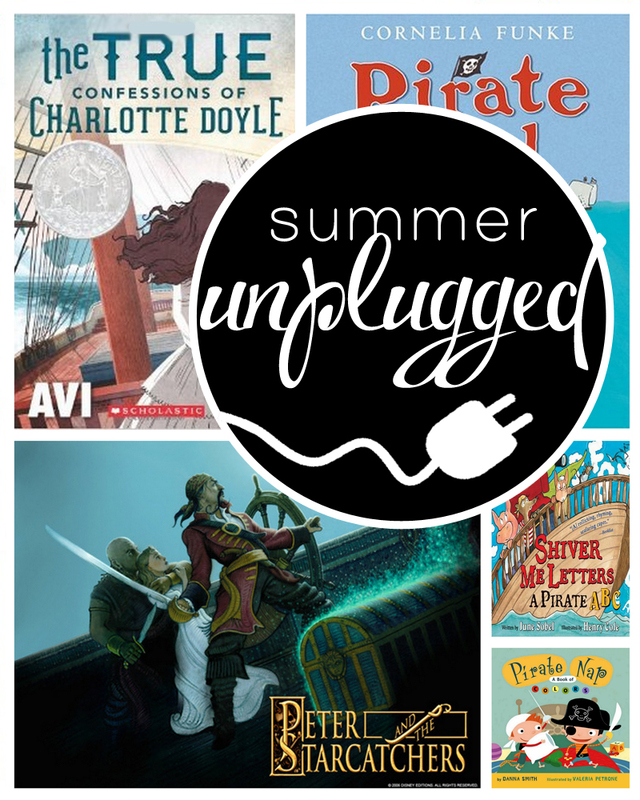 I am organizing a preschool "book club" co-op and these Summer Unplugged posts will be awesome for those who are looking for ideas! True confessions/Doyle was one of my faves!! Recently my boys checked out a quick rhyming tale called Victricia Malicia–super fun to read to pre-schoolers. In Twenty-six Pirates there is a Pirate for each letter of the alphabet, it's pretty cute. I've said before and I'm saying again…I love this series! I read this last night, put a few on hold, and they are already waiting for us when we make our weekly library run. Janssen, do you have any blog posts about how to introduce non-board books to grabby hands? maybe the only advice is wait until they stop grabbing pages, or don't let them touch the book, but maybe you have a trick or two I don't know about.